1 of 3 voters are undecided on Measure 104. If you and I don’t reach them, it will fail. Polling shows that nearly 33% of voters are undecided on Measure 104. The good news is that of voters polled who have decided, most support Measure 104 than oppose it. That means all we have to do is to educate the undecided 33% and WE WILL WIN in November. 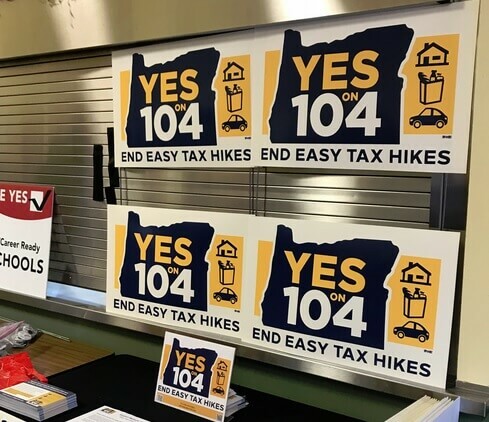 As you know, Measure 104 requires that all taxes be required to get a 60% (2/3rds) super-majority vote in both the Oregon House and Senate. This 60% rule is the best defense against new tax hikes ever utilized in American history. Without Measure 104, politicians will continue to pass hidden taxes with less votes than regular taxes. The $1.3 billion small business tax (Sb 1528) passed this year was a hidden tax. The $600 million carbon tax was a hidden tax. Both these gigantic taxes were labeled as a non-tax and allowed to bypass the 60% vote rule on taxes. Or you could simply Email this article, Facebook Like it, Tweet it out or link this article on your websites. Once again here is how you can help Measure 104. — Like what we do? You can always donate to the Taxpayer Association of Oregon here. Election Result: Big tax measure victory!